The purpose of the present dissertation is to determine whether the viewing of two particular prime-time television programs, ER and The X-Files, increases viewer knowledge of science and to identify factors that may influence learning from entertainment television programming. Viewer knowledge of scientific dialogue from two science-based prime-time television programs, ER, a serial drama in a hospital emergency room and The X-Files, a drama about two Federal Bureau of Investigation agents who pursue alleged extraterrestrial life and paranormal activity, is studied. Level of viewing, education level, science education level, experiential factors, level of parasocial interaction, and demographic characteristics are assessed as independent variables affecting learning from entertainment television viewing. The present research involved a nine-month long content analysis of target television program dialogue and data collection from an Internet-based survey questionnaire posted to target program-specific on-line "chat" groups. The present study demonstrated that entertainment television program viewers incidentally learn science from entertainment television program dialogue. The more they watch, the more they learn. Viewing a pseudoscientific fictional television program does necessarily influence viewer beliefs in pseudoscience. Higher levels of formal science study are reflected in more science learning and less learning of pseudoscience from entertanment television program viewing. Pseudoscience learning from entertainment television programming is significantly related to experience with paranormal phenomena, higher levels of viewer parasocial interaction, and specifically, higher levels of cognitive parasocial interaction. In summary, the greater a viewer's understanding of science the more they learn when they watch their favorite science-based prime-time telvision programs. 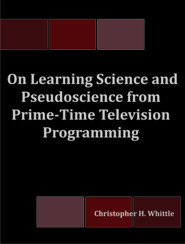 Viewers of pseudoscience-based prime-time television programming with higher levels of paranormal experiences and parasocial interaction demonstrate cognitive interest in and learning of their favorite television program characters ideas and beliefs. What television viewers learn from television is related to what they bring to the viewing experience. Television viewers are always learning, even when their intentions are to simply relax and watch the tube. Christopher H. Whittle is an educator and paleontologist who has published on a wide variety of topics including the development of paranormal beliefs, learning from popular television, museum studies, and dinosaur paleontology (Nedcolbertia, gastroliths). He graduated with a B.S. degree in Earth Sciences from the University of Massachusetts Amherst, an Ed.M. from Harvard University, and a Ph.D. from the University of New Mexico.